A $1 million gift to St. Mary’s University from the Charles E. Chewning Irrevocable Trust will aid in the creation of a new School of Science, Engineering and Technology building. The gift from the late Charles E. Chewning of St. Louis recognizes his brother, the late Brother William “Bill” Chewning, S.M., who taught Chemistry at St. Mary’s for decades. Brother Chewning served the Society of Mary and the University community for many years. 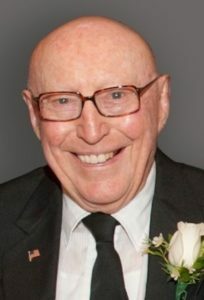 When he died in January 2019 at age 94, Brother Chewning had been a Marianist for 76 years and was a member of the St. Mary’s science faculty for 28 years, from 1977 to 2005. As a part of the St. Mary’s University Defining Moment Comprehensive Campaign, the University and its School of Science, Engineering and Technology (SET) plan to erect a new building to support the School’s vision and innovative degree programs. This new building will house classrooms, faculty offices, STEM outreach, student tutoring and student informal learning spaces. As a result of this gift, the University will name the interior space where the Chemistry Department faculty offices will be housed in Brother Chewning’s honor. Brother Bill Chewning was born in Decatur, Illinois, in 1924. He was the oldest of four brothers and sisters. During the Great Depression, the family moved to St. Louis to be closer to other family members. It was there that he met the Marianists when he entered McBride High School in 1936. In 1939, his attraction to the Society of Mary led him to enter the Marianist Postulate in Kirkwood, Missouri, to finish his high school education. Then followed his novitiate year in Galesville, Wisconsin, where he took his first vows in 1942, and two years at the University of Dayton, where he completed a degree in Mathematics in 1944. For the next 33 years, Chewning worked in secondary education in Marianist high schools from San Antonio to Winnipeg, Canada. In his first years, he was exclusively a math teacher but, in 1949, he began teaching chemistry, the field that became his great love. Early on, he partnered with another Marianist science teacher to author high school texts and lab manuals. For many years, he was active in the National Science Teachers Association, the American Chemical Society and other professional societies. In 1977, Chewning was assigned to St. Mary’s University where he would spend the next 28 years. A graduate degree in Education from St. Louis University and years of graduate work in science prepared him for his work in St. Mary’s Chemistry Department. Chewning retired from teaching in 2005.